In the 9th pAsuram, “Asil aruLAL”, swami aruLALa perumAL emberumAnAr explained how sriman nArAyANan resides in the hearts of those who wish nothing but HIM and HER. In the 10th pasuram, “nAlum ulagai”, swami explained how sriman nArAyANan resides in the hearts of those who never leaves attachment with material world and still catches hold of sriman nArAyANan. In this pAsuram, swami goes ahead and explains how sriman nArAyANan accepts and treats even the miniscule thing that a true devotee of HIM offers with untainted love towards HIM. Swamy explains how greatly sriman nArAyANan treats even a small item that HIS devotee offer. Even PoyyAmozhi reiterates this fact in”thinai thuNai nanRi seyinum panai thuNayAga koLvAr payan therivAr”.KambanAtaAhvAr when describing the lotus feet of the ONE who measured this whole universe, says “uyarndhavarku udhaviyoppave”. than ponnadi anRi: “than” refers to the condition where sriman nArAyANan is present naturally in all the souls without any cause. “ponnadi anRi” refers to all that except the beautiful and the most desirable lotus feet of sriman nArAyANan. Here, “than ponnadi” hence means that each and every soul in this universe has the same and equal right on the lotus feet of sriman nArAyANan. “ponnadi” refers to the feet that is supreme in terms of beauty as well as enjoyment. maaRRonRil thAzhvu seyyA anbar: sriman nArAyANan’s lotus feet , as seen above ,is both supremely beautiful and every one of the infinite jIvAthmAs has a right on them. Hence, “maaRRonRil thAzhvu seyaar anbar” refers to those people who does not divulge themselves in anything apart from those diving lotus feet of sriman nArAyANan. The word “maaRRonRu” refers to worldly wealth, the pleasure of a soul enjoying itself (kaivalyam) etc. The word “thAzhvu” is used in a derogatory manner and means “anything low” that would point to all other things apart from the lotus feet of sriman nArAyANan. Here, it is appropriate to refer to thiruvAimozhi pAsuram “sadhiriLa madavAr thAzhichiyai madhiyAdhu” (thiruvAimozhi 2.10.2). The word “thAzhchi” in this thiruvAimozhi pAsuram and “thAzvhu” in this pAsuram both mean the same thing. The same thought is conveyed in “thAzchi maRRu engum thavirthu” where AzhvAr describes the lowliness of indulging in anything and everything apart from sriman nArAyANan. 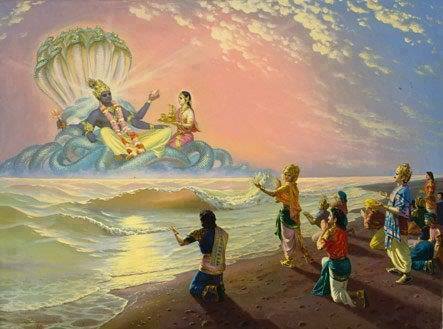 Hence, we can infer that there is a special group of bhAgavathAs who does not immerse themselves in anything apart from the lotus feet of sriman nArAyANan. ugandhittadhu: The word “ugapu” means happiness and “ittadhu” would mean “to give”. Hence, this word totally would mean “that which was offered with lot of happiness”. There are two types of being a servant. The first type is where one is a servant in accordance with the sAsthrAm’s order. He is being a servant just because he is asked to be. The second type is where one is a servant because of outpouring of love. For example, all the things that a wife does to her husband is in accordance with the rules of “sAsthram” in how a wife should behave to her husband. thiruvaLLuvar says “tharkAthu tharkondAn peni”. This is when a husband does all the things for his wife that is a because of the excessive love that he has towards her. Similarly, devotees should be a servant not out of compulsion enforced by sAsthrams. It should be done out of pure love that he or she has towards sriman nArAyANan. This is what swamy nammAzhvAr refers as “ugandhu pani seydhu” in his thiruvAimozhi. Hence, such devotees who give out of their excessive love towards sriman nArAyANan, how much ever little it may be, HE relishes it nothing else. pon piRazhum mEruvAy koLLum: sriman nArAyANan will regard the tiniest thing that HIS true devotee gives HIM as a huge “mEru” mountain that sparkles like and is full of precious jewels and ornaments. Had HE be ONE that needs something in order to be rich, HE would have grown more complete by taking the offering that a devotee gives. So, HE would have yearned for those little thing in order to grow richer. However, this would have been termed as “alpathanam” or “one who yearns for silly and petty things”. But the fact of the matter is that HE is not like that. HE is one who is without any defects, without any holes that needs to be filled. Hence, there is absolutely no need for HIM to get anything from somebody and so subsequently erase that defect or grow richer. Hence, how much ever small HIS devotee gives, HE accepts it with utmost satisfaction and regards that thing as equivalent of mEru Mountain. This type of sriman nArAyANan is being described in the next paragraph. viraiyAr thuzhAy alangkal mAri mAk koNdal nigar mAl: sriman nArAyANan is ONE who stands with a beautiful and fragrant thuLasi garland. HIS body resembles the hue of dark rain bearing clouds. “virai” is fragrant, “alangkal” – garland, mAri – rain , mA- big, koNdal – clouds. Essence: Since HE is being described as ONE who is complete with everything, to those pure bhAgavathAs who does not keep their heart and mind in anything apart from HIS lotus feet, HE shows more and more of HIS beauty of HIS body with all those beautiful ornaments. Thus, HE makes sure that they are always glued to HIM and their bhakti is increased more and more. So, finally, with these meanings explained, we can re-word the phrase in the pAsuram to “viraiyAr thuzhAy alangkal mAri mAk koNdal nigar mAl than ponnadi anRi maaRRonRil thAzhvu seyyA anbar ugandhittadhu aNu eninum pon piRazhum mEruvAyk koLLum” which gives the essence of the pAsuram.